advertisements and 30 articles had been collected within the first 3 months. The first “Integration of Financial Technology and Equipment of Modern China” had been published in Feb. 1998 and its report and ceremony of the first publishing held in Construction Bank of Beijing in that month. The coming out of this book, a pad for the publishing of finance and technology, was reported by more than 30 media in Beijing and Shanghai and helped the company settling its important status in national industry of financial information. 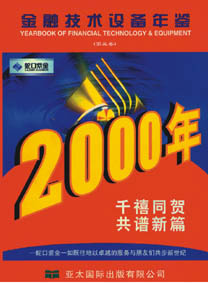 From then on, this book was published every two year and five in total so far, and renamed as “Yearbook of Financial Technology and Equipment”. Its volume includes thesis, memorabilia, record of financial institutions and record of technological enterprises. A “ Character of Finance and Technology” had been added in the fifth volume that made the book much more rich. This book has already been a necessary reference book in finance and technology. All of us are waiting for the publishing of the next volume of this book. To thank for those who pay attention to this book, we will keep on broaden its capacity and make it more perfect.